When United Nations personnel commit acts of sexual exploitation and abuse against the very people who look to the Organization for protection and assistance, the trust between the UN and its beneficiaries is undermined. Through the terrible actions of a few, the values and principles of the UN are betrayed and the credibility of UN peacekeeping operations and the UN as a whole is tarnished. Over the years, the UN has been confronted with the issue of sexual exploitation and abuse by its personnel in its field missions around the world. In April 2003, the General Assembly adopted a resolution (A/RES/57/306) where it requested the Secretary-General to take measures to prevent sexual exploitation and abuse in humanitarian and peacekeeping operations and respond rapidly when allegations come to light. The prohibition of sexual exploitation was outlined later that year in Secretary-General’s Bulletin on Special measures for protection from sexual exploitation and sexual abuse (SG/SGB/2003/13). In March 2005, the Zeid Report, a comprehensive strategy to eliminate future sexual exploitation and abuse in United Nations peacekeeping operations, was issued. The Zeid Report provided a comprehensive and innovative package of recommended reforms for both the UN Secretariat and Member States. Although the focus was on sexual exploitation and abuse, the problems identified related to a range of misconduct, which highlighted a lack of awareness of UN standards of conduct, unclear procedures for making complaints, incomplete data on misconduct and insufficient capacity in peacekeeping missions to conduct investigations. One of the first steps taken to rectify this situation was the creation at Headquarters of the Conduct and Discipline Unit and the establishment of Conduct and Discipline Teams in field missions in November 2005. In the years following the Zeid Report, the UN has implemented structural changes and put in place measures and initiatives to prevent sexual exploitation and abuse, to improve the Organization’s response to allegations, and to ensure that victims of sexual exploitation and abuse receive appropriate assistance and support in a timely manner. 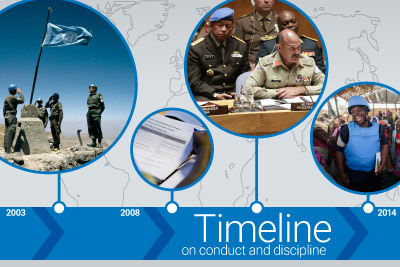 In 2014, the Secretary-General’s report to the General Assembly on Special measures for protection from sexual exploitation and sexual abuse (A/69/779) set out a wide range of new initiatives, which included expanding training and vetting of personnel for prior misconduct while in the service of a UN operation, creating new tools to enhance accountability and establishing more practical tools to support victims. Additional proposals and initiatives were put forward in the 2015 report to the General Assembly (A/70/729). The emphasis was on support to victims, greater transparency, and the need for Member States to be effective partners in achieving financial, administrative and criminal accountability for those who commit acts of sexual exploitation and abuse. For the first time, the report included information on the nationality of military and police personnel implicated in credible allegations of sexual exploitation and abuse. In 2015, the world shared a feeling of outrage in learning of allegations of sexual violence by non-UN, foreign forces serving in the Central African Republic. Consequently, the Secretary-General appointed an independent panel to review the response of the UN to those allegations. In its report, the Panel made recommendations on reforms to deter future incidents of sexual exploitation and abuse and to improve the response of the UN to allegations received. In February 2016, the Secretary-General appointed the Special Coordinator on Improving the United Nations Response to Sexual Exploitation and Abuse with a mandate to organize, unify and prioritize the United Nations system-wide measures for prevention and response. Efforts are underway to ensure coherence and harmonization among UN entities, and building on work done to date, gaps are being addressing by robust, new measures to implement the Secretary-General’s zero-tolerance policy. The UN remains resolute in ensuring ever more effective means to prevent and address the profound betrayal through such acts by UN personnel against the people they are charged with protecting. The UN has a three-pronged strategy to address misconduct: prevention of misconduct, enforcement of UN standards of conduct, and remedial action. Actions are taken in each of these areas to address all types of misconduct, but a particular focus is put on addressing sexual exploitation and abuse. Prevention lies at the core of the UN strategy to combat sexual exploitation and abuse. Prevention must be undertaken in a proactive and comprehensive manner in partnership between the UN and its Member States. All UN personnel receive training on the UN Standards of Conduct both before and after deployment. In addition, in 2016 the Organization launched a mandatory online training programme on the prevention of sexual exploitation and abuse. Missions inform the host populations of what is acceptable behavior by UN personnel and how to report wrongdoing through the existing mechanisms. 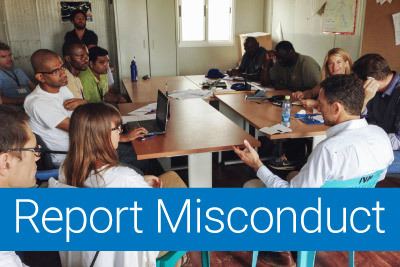 Community-based complaint reception mechanisms have been established and community liaisons identified as trusted channels for reporting misconduct by UN personnel. All personnel are vetted for records of prior misconduct while in the service of a UN operation, and missions carry out regular risk assessment visits in the mission area and undertake risk-mitigating actions, with a particular focus on risks related to sexual exploitation and abuse. Missions have established standing task forces on sexual exploitation and abuse, and put in place sexual exploitation and abuse focal points to provide guidance and monitor the application of and adherence to the zero-tolerance policy. The Secretary-General, in collaboration with Member States, continues work to improve the speed and quality of investigations. A six-month timeline for the completion of investigations has been established for UN investigative entities, and Member States have been requested to adopt the same timeline as their standard for completing investigations. In circumstances demanding greater urgency, the UN has indicated that it will aim to complete investigations into allegations of sexual exploitation and abuse within three months, and makes the same request to Member States, in appropriate cases. Urgent action upon receipt of a report of sexual exploitation and abuse creates the best conditions for investigations. Consequently, Immediate Response Teams have been established in peacekeeping missions to gather and preserve evidence, pending the initiation of an investigation. A training programme for such teams was developed and rolled out in pilot trainings in 2016, with the first training sessions organised in the missions in the Central African Republic and Haiti. In 2007, the General Assembly adopted the Comprehensive Strategy on Assistance and Support to Victims of Sexual Exploitation and Abuse by United Nations Staff and Related Personnel. This Comprehensive Strategy outlines the provision of assistance and support to complainants, victims and children born as a result of sexual exploitation and abuse, which is provided in cooperation among UN system entities. Complainants and victims are provided with support and assistance, such as medical care, psychosocial support, legal assistance, and immediate material needs such as food, clothing and safe shelter through local service providers. The Conduct and Discipline Teams have engaged in mapping the services and assistance available for victims of sexual exploitation and abuse. In many instances this has been done in consultation with other UN and international and local NGO partners. Assistance and support is provided even before an investigation into the allegations has been completed. Where a child has been born as a result of sexual exploitation and abuse by UN or related personnel, the UN will work to facilitate the pursuit of claims of paternity and child support. A victim assistance protocol is being finalised, outlining the roles and responsibilities of key actors for the effective referral, provision and monitoring of the quality of services provided. In March 2016, the Secretary-General established the Trust Fund in Support of Victims of Sexual Exploitation and Abuse. The trust fund is aimed at, among other things, engaging in community outreach and addressing service gaps in the provision of assistance and support for complainants, victims and children born as a result of sexual exploitation and abuse. The Trust Fund will not be used to provide compensation to complainants or victims of sexual exploitation and abuse. The Secretary-General has called upon all Member States to contribute to the trust fund to demonstrate the shared commitment to providing meaningful assistance to those who have been victimized by UN personnel. The UN and its Member States are committed to taking decisive action to uphold universal values and ensuring protection for civilians, respect for the dignity of victims and accountability when these values are violated. Transparency and accountability are the critical means through which the UN and its Member States demonstrate their commitment to the Secretary-General’s zero-tolerance policy, retain the trust of the international community and provide justice for victims. Accountability is a shared responsibility requiring action by all, including Member States. Sanctions imposed in relation to substantiated allegations of sexual exploitation and abuse must be commensurate with the seriousness of the offence, in particular where actions may amount to criminal conduct. There must be no impunity for personnel who commit sexual exploitation and abuse while in the service of the UN. A Policy on Accountability for Conduct and Discipline in Field Missions was issued in 2015. The Policy, which applies to the Department of Peacekeeping Operations, the Department of Field Support and the Department for Political Affairs, details the roles and responsibilities in field missions and at Headquarters for addressing misconduct and explains how accountability is to be achieved when personnel fail to observe the UN standards of conduct. The Policy also highlights the responsibilities of Heads of Mission and senior managers and commanders in this regard. In March 2016, the Security Council adopted resolution 2272 (2016), addressing sexual exploitation and abuse by peacekeepers deployed under Security Council mandates. The provisions of resolution 2272 focused primarily on military personnel and members of formed police units serving in peacekeeping missions, and the responsibility of troop- and police-contributing countries to investigate allegations of sexual exploitation and abuse and hold their personnel accountable. Through resolution 2272, the Security Council requested the Secretary-General to repatriate a particular military unit or formed police unit when there is credible evidence of widespread or systemic sexual exploitation and abuse by that unit. The resolution further requested that the Secretary-General replace all units of the troop- or police-contributing country from which the perpetrator is from if appropriate steps have not been taken by the country to investigate the allegation, and/or when the perpetrators have not been held accountable, and/or when there has been failure to inform the Secretary-General of the progress of its investigation or actions taken. As a further measure to enhance transparency and accountability, the 2015 report of the Secretary-General on Special measures for the protection from sexual exploitation and sexual abuse (A/71/729) included, for the first time, country-specific information for allegations involving uniformed personnel. The Secretary-General has emphasized that it should be seen as a matter of honour when a Member State takes decisive action against perpetrators of sexual exploitation and abuse. It is encouraging to note that best practices are starting to emerge among Member States, ranging from enhancing pre-deployment training, conducting effective and thorough investigations and timely reporting, holding on-site court martial proceedings and imposing strict sanctions for perpetrators, to appointing focal points in the national legal system to facilitate paternity claims. The UN remains committed to working together with Member States to ensure that all UN personnel, whether civilian, police or military are accountable for their actions while in the service of the UN. If you want to know more, take a closer look at the timeline of measures and initiatives undertaken over the years in the area of conduct and discipline, with a particular focus on sexual exploitation and abuse.